:: An’Tryice Salon & Spa :: | An’Tryice Salon & Spa is a full service Salon with highly qualified and licensed beauty professionals catering to all your hair, body and skin care needs. We offer a full menu of styling services including haircut, color, highlights, conditioning treatments. Whether you want a hairstyle for a special occasion or you need a professional look for work or that big job interview, our stylists will ensure you leave the salon looking and feeling fabulous! An’Tryice also offers a full range of affordable personal care and relaxation services that will leave you renewed, pampered and refreshed. Treat yourself to one of our customized glycolic and oxygen facials, a deep tissue massage or a soothing reflexology pedicure. Our estheticians will create that VIP immersive experience that will transcend the senses. An’tyrice Salon and Spa – Where your beauty is our focus! At An’Tryice Salon & Spa, we believe that every person’s unique journey is enhanced by style and beauty. We offer our clients an engaging atmosphere where they can refine or even redefine they look to provide that extra feeling of confidence that we would all like to have every day. In this space, our clients are the axis and your feelings, desires and expectations are completely respected. An'tyrice hair is 100 percent remy virgin hair. In 2010 An'tyrice hair was manufactured by Angelline Smalls. Our service provided is top quality treatment. At An'tyrice salon we only recommend the very best. 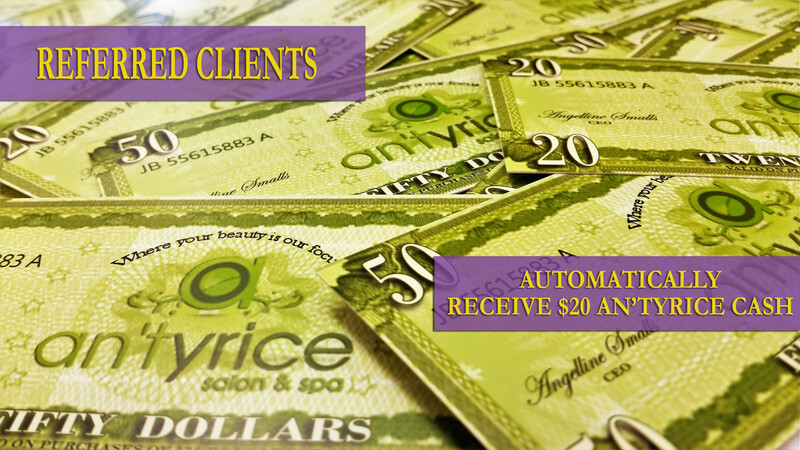 © 2012 An'tyrice Salon & Spa. All Rights Reserved.